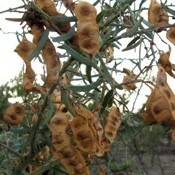 Acacia victoriae is drought and frost resistant. The seeds are collected in summer, ground and roasted. Their nutty texture and coffee-like aroma have made them highly sought after for use in confectionery and baking. This seed pack contains 30 seeds and includes instructions for germination and harvesting the seed. Seeds from the Wattle tree are edible, but there are a few species that aren’t so be sure to check with an expert before trying them. A great bushfood treat. 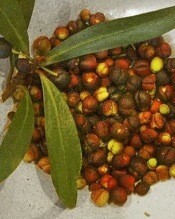 These seeds are Acacia victoriae.